Anyway, it's Sweet Sketch Wednesday and Arlana has another great sketch and we have another fabulous sponsor... It's Inktegrity and you all know how much I love Joni's images. And here's my take on the sketch using one of the newest images from Inktegrity. I love fairies so Joni's newest collection was right up my alley. Isn't Garden Fairy cute? I just love her. I used a favorite color combo, pink and green, and just had so much fun with this sketch. 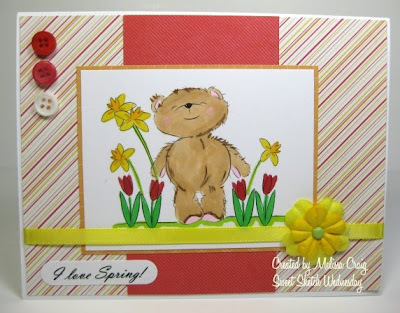 I hope you enjoy my card and will head on over to Sweet Sketch Wednesday to play along. Arlana and the team has some wonderful eye candy for you. Thank you so much for stopping by! Good Morning! A quick post today for my challenge blog, Tuesday Morning Sketches. This week's sponsor is Jodie from Bugaboo Stamps. I love Jodie's images, they are all so wonderful and I want to thank Jodie for sponsoring. Here's my card. I think this bear is just one of the cutest ever! I do hope you'll join us this week. Thanks for stopping by! Good Morning! Happy Monday to you! I am so excited to be able to share a sneak peek with you for the April release of Ethereal Forest Designs. Lee has come up with some wonderful images for Spring/Mother's Day that you are just going to love. 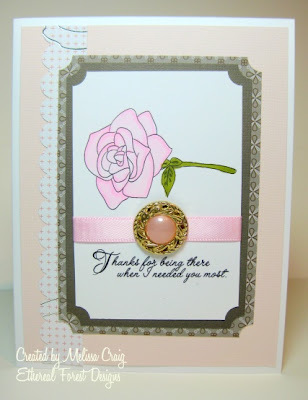 Here's my card that I made with the single rose and the Occasions Sentiments set. I did follow the sketch from Our Creative Corner. It was a fun sketch to follow. Thanks for stopping by today! Be sure to visit the design team all week, we all have something to share with you. Good Morning Everyone! I hope you're all doing well. I do have a card to share with you that I made for my monthly card group. I am so proud of this card! The challenge was to create a shadow box card. The tutorial can be found on SCS here. This card went together so easily, I amazed myself. I had actually watched a video tutorial and in the video the circle Coluzzle template was used and the SCS tutorial used an oval Coluzzle template. I decided I wanted a different opening so I went about to make this card a little more complicated, but it worked out perfectly. I used the Labels One Nestibilities templates to create the opening. Getting it to layer correctly took a little time and patience, but the end results were worth it. I pulled out some CTMH supplies that I bought several months ago when I did the Crafter's Yard Sale. I got this stamp set and matching paper with embellishments for $10! I stamped the flowers using Bashful Blue, Brocade Blue, Pink Pirouette, Regal Rose, Certainly Celery and the sentiment in Night of Navy. I hope you enjoy this card as much as I did making it. I was quite giddy after I completed it! Thanks for stopping by and Happy Fabulous Friday! Good Morning! I hope you're doing well. I am running a bit late this morning, so I'll get right to my Lindsay's Stamp Stuff post. I played along with a couple of challenges, too. I haven't played Arielle's ColourQ challenge in awhile, so I had to this week. I also used the sketch from The Pink Elephant, which was way fun. I actually pulled out some old... I don't like that word, some hoarded dp from SU!. The image is from Lindsay's Pretty Primative set, which happens to be one of my favorites. I hope you like my card. 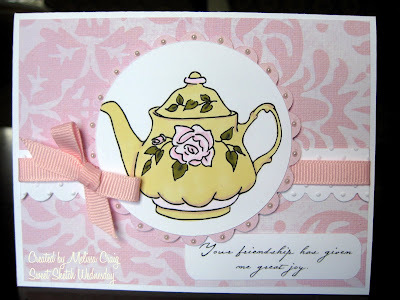 Please visit Lindsay and the rest of the team to see what lovely cards and projects they have to share with you. Thanks for stopping by. Good Morning! It's time for another sweet Wednesday at Sweet Sketch Wednesday! I am so excited about this week's sketch and sponsor. 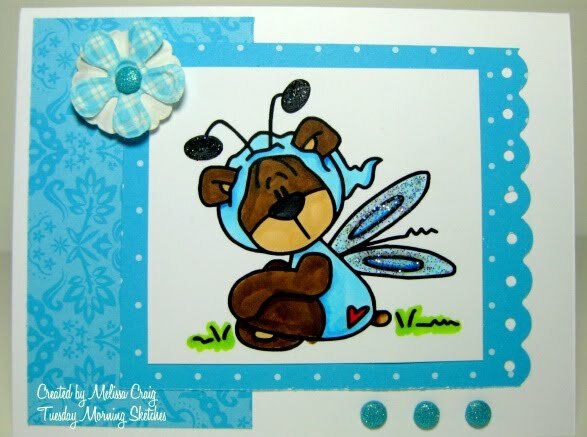 This week we have the sweet Jodie from Bugaboo Stamps joining us and she's offering the winner a prize of 7 digi stamps that value $21! Wow!!! I used one of Bugaboo's free images because I've had it and have been waiting to play with it. I was very happy when I finally got the chance. I love this frame. It has so much possibility! I specifically chose colors around my favorite Basic Grey paper, Lily Kate. That name made me want another baby so I could name her Lily Kate... don't worry, I did come to my senses. I do hope you'll play along with us this week. Head on over the Sweet Sketch Wednesday to find out how to join us and to see all the wonderful cards from the rest of the team. Thanks for stopping by! Good Morning! I hope your week is off to a great start. I was off yesterday and instead of spending most of my day crafting like I wanted to, I had to sit down with the checkbook and pay bills and get the laundry done. Oh well, at least those chores are done. I have a fun new sketch over on my challenge blog, Tuesday Morning Sketches. You'll have to come play with us. Stitchy Bear Stamps is our sponsor this week and talk about some fantastic images with a huge variety! I do hope you'll head on over there and play along with us this week. Thanks for stopping by! Good Morning! I hope you all had a great weekend. I worked all weekend, but it wasn't bad and I'm off today! Yippeee!!! I'm staying in my craft room all day! Congratulations Deanne! Please email Arlana at sweetberrydesigns@hotmail.com to claim your prize. Now for today's card to share, I've used this image before but I love it and it worked perfectly with Cute Card Thursday's theme for this week: Happy Anniversary. I really loved the sketch from Eat, Sleep, Sketch so I threw that in there, too. I used the Huggie Bears image and created my own sentiment. I wanted them to look like polar bears so I used very little color, but did use my Copics and Prismacolor markers. 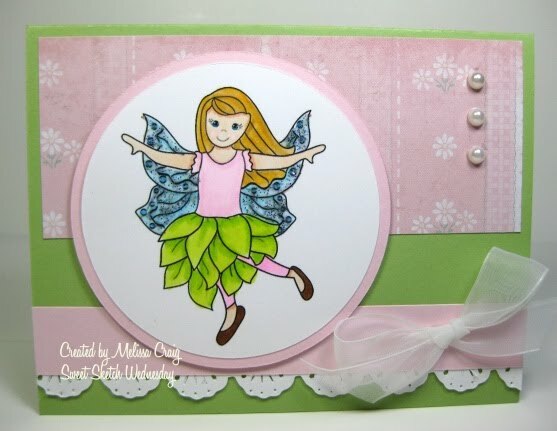 The paper and embellishment came from the CTMH Tickled Pink collection. I love this pack! The colors are spectacular. I hope you enjoy my card and thanks so much for stopping by! Here comes Peter Cottontail…Hopping down the Bunny Trail……Are you ready for some fun? Yes!!! So, pull up a chair, grab a refreshment of your choice and join us in Sweet Sketch Wednesday’s first quarterly Blog Hop. We are joining with Digi Stamp Boutique for this celebration. The winning images will be awarded by Sally Ann at the end of the Blog Hop. Let’s get hopping!!! 1. 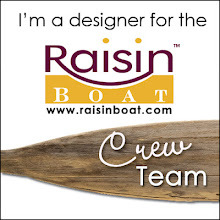 Comment on each of the Design Team blogs and become a follower. 2. 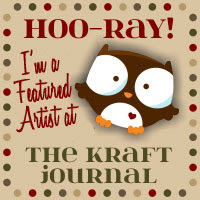 Comment on Digi Stamp Boutique blog and become a follower. 3. 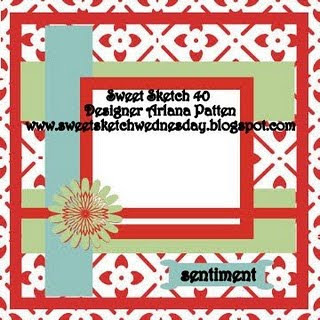 Return to Sweet Sketch Wednesday after you have completed the blog hop and leave a comment and become a follower. 4. By doing this, you will have a chance to win an image or images from Digi Stamp Boutique. That means you will have 12 chances to win a prize. 5. 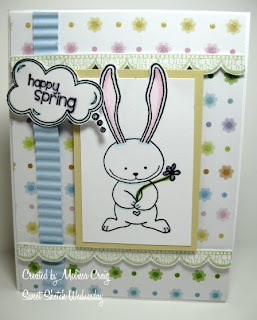 After participating in the Bunny Hop, create an Easter or Spring card with the Bunny Hop Sketch or create an altered Easter/Spring item. Then post it on Mr. Linky. Completing all of this will qualify you for the grand prize on the Sweet Sketch Wednesday blog. 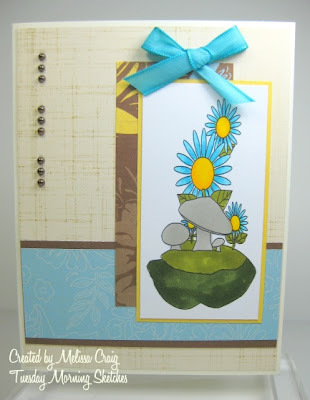 Head on over to Arlana’s blog and see her gorgeous card. Then hop on over to the next blog and so forth in order. 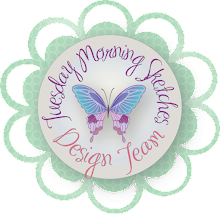 The next Design Team name will be posted so that you will be able to follow from one blog to the next. i.e: From here hop to Nancy’s blog. 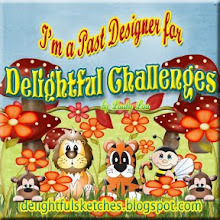 Remember, you must leave a comment on each Design Team’s blog and on Digi Stamp Boutique and become a follower to win. 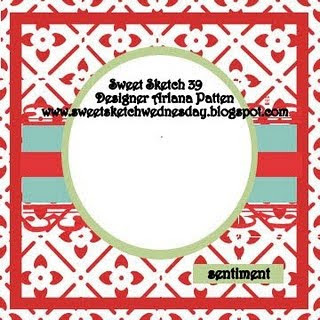 When you are finished, be sure to return to Sweet Sketch Wednesday, become a follower and leave a comment that you have completed the Blog Hop. 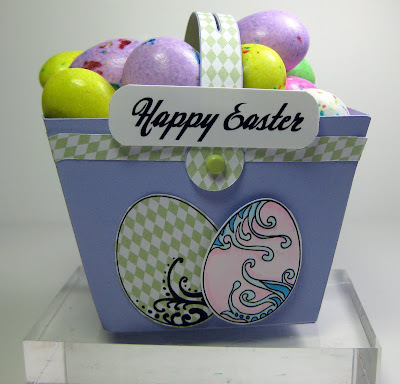 Happy Hopping and thanks for joining us for this Easter celebration. Hoping to see your creations too….Hop to it! Good Morning! It's that time again... It's Wednesday which means the week is half way over and Arlana at Sweet Sketch Wednesday has another awesome sketch to play with! 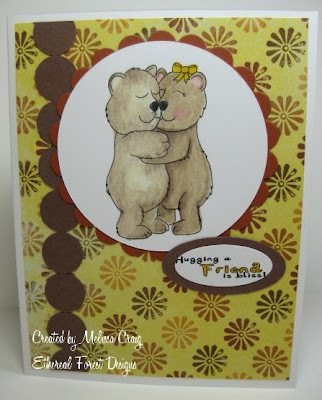 Sally Ann of Digi Stamp Boutique is back as our sponsor and I just love her images. This is Isabella and she is so adorable! I just love her sweet little face. I lost my recipe list for this card, but if I find it, I'll update the post later. 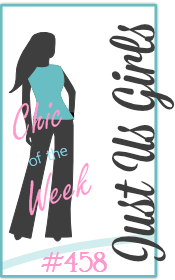 I hope that you join Arlana and the other sweet gals this week. Be sure to visit Sweet Sketch Wednesday to find out how to play. Thanks for stopping by! Hi All! Really quick post here as I'm setting up this before I head to work. I have to be there by 6am. Yipes! Head on over to my challenge blog for another fun challenge - this week we're making something other than a card. OK, so I added a card, but you get the idea. Cute right? And so super easy. I used one of the cute bags that come in the Pretty Favors SVG set from Lindsay's Stamp Stuff. Cut it using SCAL and the Cricut. Because I have a baby bug, I had to size it down just a tiny bit. I used decorative paper from American Crafts. Cut mats using Nestibilities scallop ovals and then added the image that was provided by this week's sponsor, AiFactory. I hope you join us this week! Thanks for stopping by. This is Mary Mouse and Mouse Sentiments. I also played along with the Eat, Sleep, Stamp challenge (sketch #74). I had a lot of fun with this card. The sentiment didn't come out as clear as I'd like, but it does say "You're the cheese in my macaroni." I'm going to send it to a friend of mine who just happens to love my macaroni and cheese. I hope you like my card that I made. I think my friend will. Thank you so much for stopping by! Good Morning! I hope your Friday is a fabulous one! 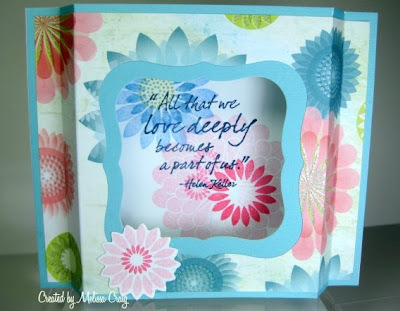 I've had this digi set from Sweet n Sassy stamps and had yet to play with it. It is an adorable set! So I set out to create an antique country look and I am pleased with the results. I hope you like my card. And if you'd like to see another card created with this sketch, check out my sister's card here. Wow! Thanks for stopping by! Good Morning! We're on the downhill side of this week so I do hope all is going well for you. Yep! Lindsay has got a great sale going on at her store. But before you go shopping, let me share my card with you. I love how this card turned out! 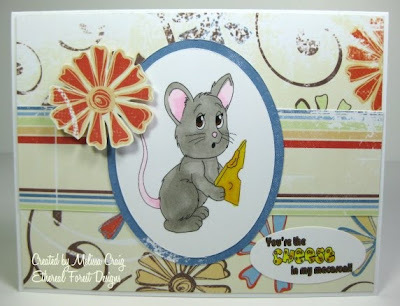 I used the sketch from the Sketch and Stash Challenge blog and I must say, I love love love this sketch. It made a card that ended up being done last minute last night go together very easily. I used the ladybug image that is available as a single image or in a set available at MyGrafico. 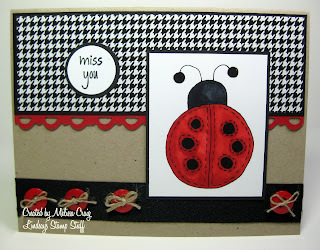 I also used Lindsay's black Houndstooth paper. I hope you like my card, I had a lot of fun making it. Be sure to visit Lindsay and the rest of the team for more inspiration and I'm sure Lindsay has a freebie. Thanks for stopping by! Good Morning! I have great news to share today... I got a job!! I am so thrilled. Now we'll get to why you're really here. It's time for Sweet Sketch Wednesday and Arlana never disappoints when it comes to having a great sketch to play with. We also have a very sweet sponsor joining us this week. 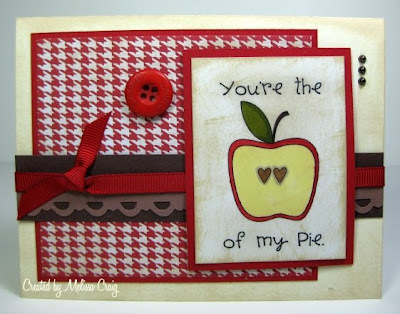 Kelly Landers with Ippity Stamps is sponsoring this week and talk about some super sweet images. I want to thank Kelly for being so generous is sharing her stamps with us to play with. I changed the sketch just a tad for my thought bubble to be the flower embellishment and omitted the element going across the focal image. I didn't want those sweet feet covered up. I started with white card base and then covered it with decorative paper that I got out of the Glitter Mat stack from DCWV. 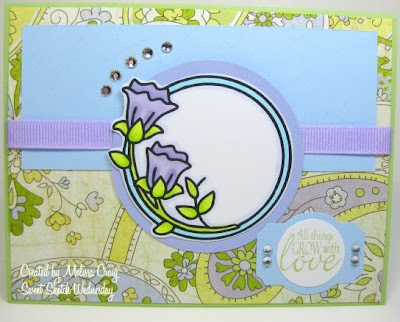 I crimped a piece of Bashful Blue card stock and then stamped the cute scallop border and cut it out. I colored the image with Copics, but only a little. Just a reminder, in case you didn't see the announcement on my sidebar, Arlana and the SSW team is hosting a Bunny Hop March 19th, 20th & 21st. The hop is sponsored by Digi Stamp Boutique!! Love her images. So mark your calendar and join in the fun. 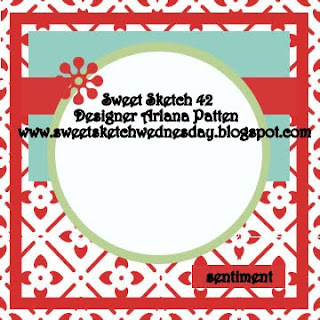 Now head on over to Sweet Sketch Wednesday to play along and gets lots of inspiration from the team. You're going to love all the cards the team made! Thanks for stopping by. Good Morning! I hope you're all doing well. Just a quick post today for my Tuesday Morning Sketches challenge blog. I am not real happy with how this card turned out, my own sketch actually stumped me. 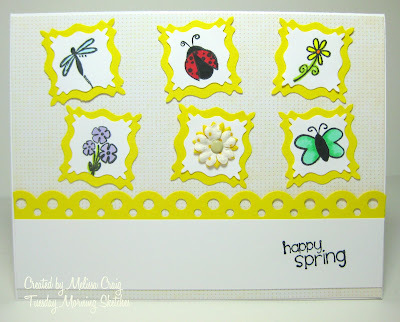 This week's sponsor is Marti from Pez-a-Doodle Designs and she offers her own line of great stamps, but also offers a nice variety of Studio G $1 stamps (in sets), so I used a variety of my own Studio G stamps to create a bright Spring-y card. The sentiment is from Ippity stamps. My card is really lacking something. I achieved the brightness that I wanted, though. I do hope you join us over at Tuesday Morning Sketches! Thanks for stopping by. Good Morning! I hope you all had a great weekend! If you didn't join us yesterday for the blog hop, there is still time to do the hop and enter to win $10 in free images!! For my card share today, I have a sweet one to show you. I loosely based this card on the sketch from Just Us Girls. I omitted a solid line and scallops on the side because I absolutely adored this paper that I wanted it to shine through. Hopefully, it still counts. 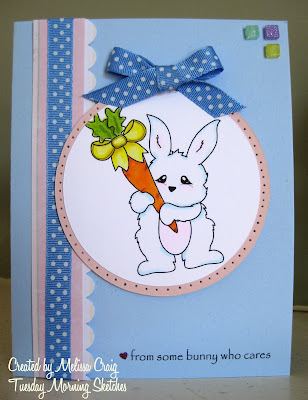 I hope you like my card and definitely get in on the blog hop. Thanks for stopping by! Ethereal Forest Designs First Blog Hop! “Welcome to the First “Ethereal Forest Designs” Blog Hop!!! If you just happened to drop by my blog and you are not aware of this wonderful event taking place, please go back to our Design Team Coordinator, Darsie Bruno’s Blog HERE and start your hop! Along the way, please make sure you comment on each one of the design team members blog, then return to the Ethereal Forest Designs blog and make a comment! At the end of the hop, one lucky winner who has commented on all the blogs will receive a $10.00 voucher to the Ethereal Forest Designs Store. The images I used is Miracle the Unicorn and Unicorn sentiments. I did follow a sketch from the Our Creative Corner challenge blog. I dug out some older decorative paper from PaperTrey Ink. I colored the image with Copic markers (B0000, B02, B05, RV000, Y28) and then inked the edges with chalk ink. Then embellished with ribbon, a ribbon flower and pearls. The winner will be announced on the Ethereal Forest Designs blog on Friday, March 12th. Deadline to complete the hop will be Thursday, March 11th! Thank you for taking the time to play along. Now, to continue the blog hop, please visit Shirley. All of the images used in the design teams creations can be found at the Ethereal Forest Designs Store. Good Morning! I can't be more excited than to share the news with you that we finally don't have to manually operate the heat anymore!! Whoo-hoo!! My husband and I determined that the only thing wrong was that the thermostat needed to be replaced. So he picked one up and after a lengthy conversation with our brother-in-law, he got it installed and viola! We can sleep thru the night now without having to get up to turn the heat on or off! Life is good. I have another tag to share with you that is for the 2nd spot in the tag swap I'm participating in on SCS. 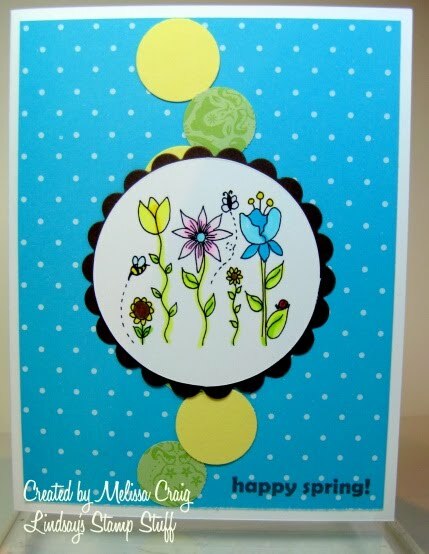 This uses images from the new Spring Set from All That Scraps. I also used a shape from one the fonts I'd found and cut it using the SCAL software and the Cricut. I also used the Cricut to cut the circle in the center. The rest of the cutting was all by hand. I hope you enjoyed my little project today and that you get that I am saying "hi" to you! Thanks so much for stopping by! Enjoy your weekend! 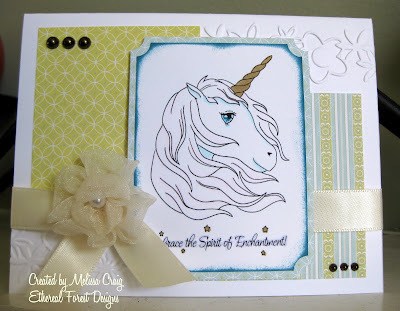 And don't forget to stop by on Sunday for the Ethereal Forest Designs first blog hop. There's a prize involved!! Good Morning! Its time to start thinking about Easter treats! Actually, maybe not quite yet but I'm hoping it'll bring Spring sooner. Lindsay introduced a set last week called Cute Easter and it is really cute. I had found a super adorable SVG for a basket on the SVG Cuts blog and was super excited that it would work on my baby Bug. So I brought the two together. You will notice a little slit in the handle - this is for a name card. These would be really cute place settings for an Easter party. Or decorate them differently and they can be used for a birthday party goodies. Be sure to visit Lindsay and the rest of the team. Always so much eye-candy. I love it - no calories but a whole lot of satisfaction. Thanks for stopping by! Good Morning! I hope you're having a sweet week so far. Arlana has another great sketch and Sweet Sketch Wednesday is being sponsored this week by Kathryn of KLM Digital Designs. The prize is 3 digi images of the winner's choice, so you'll definitely want in because her images are wonderful. I picked the teapot from KLM Digital Designs which is currently a freebie. I have a love for teapots. I have many miniature ones that my sister has given me. I do hope you'll join us this week. 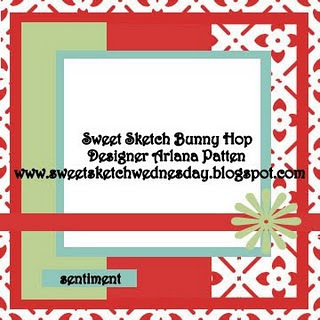 Hop on over to the Sweet Sketch Wednesday blog for more inspiration and play along. Thanks for stopping by. Good Morning! Happy Tuesday to you! I've got a really cute sketch (if I say so myself) to share with you over at Tuesday Morning Sketches. Joni from Inktegrity is sponsoring this week and I am so delighted! If you joined me here on Friday then you know all about the fun blog hop and the wonderful new images she released and if you're an Inktegrity follower, then you know about the new releases she did just yesterday. Isn't that bunny the sweetest!? I just love him. I also just noticed that I put him on my card a little crooked. Now it looks like his carrot gift is a little too heavy for him. I hope you head on over to TMS to join in the fun. I'm also looking for an April Guest Designer, so if you're interested, head on over there to find out how to apply. Thanks for stopping by. Ethereal Forest Designs - Release Day! !